I've always picked up stray scraps of notebook paper from the sidewalk, even before there was a magazine devoted to exactly that. Apparently lots of people are fond of the stuff they find on the ground. 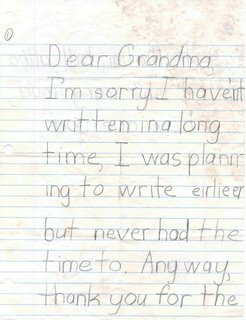 This one starts out okay -- a clear example of the "Dear Grandma" genre. 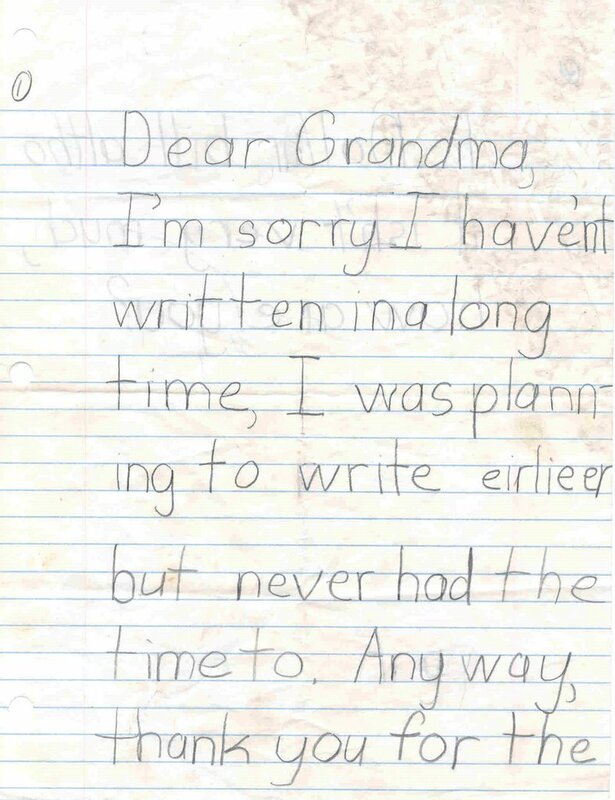 Pretty hard to get into trouble with a Dear Grandma letter, right? You go through the "How are you? I am fine" sequence, say a word or two about school -- "Homework is really hard this year. I hate my teacher." And maybe include something positive about yourself, something to make Grandma proud, variously "I got an A on my math test," "Me and my brother shot hoops for 2 hours on Friday," "I haven't puked in the car for a whole week," or "My therapist said that I shoplift because I need to develop boundaries," depending on your strengths. Then you can delve into the realm of the cryptic, like "Mom says we can get a brand new iguana," the object being to fill up the rest of the page. Writing large is very effective. 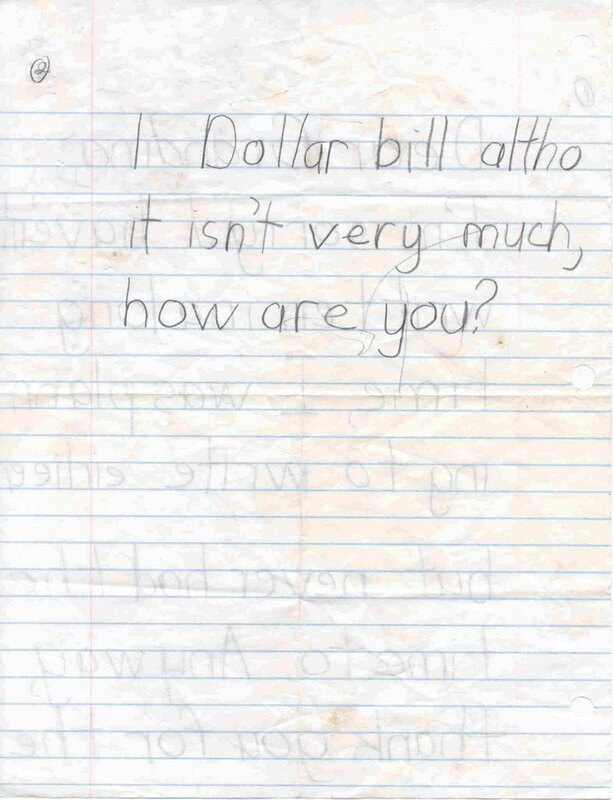 Our young letter writer was doing fine until he got to page 2. Then we see why the letter was never mailed. A 1 Dollar bill? Why would he even bother to mail the thank you note? No incentive. In fact, the closing "how are you?" 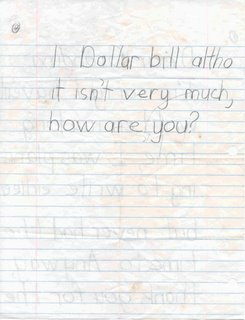 has become a sly snipe: clearly one must enquire after the mental health of a relative who is so out of touch that she thinks a 1 Dollar bill is an adequate gift for a young person with Needs. That's not even enough to buy a cell phone ringtone. Exhibit B in our Found on the Ground series is from the archives. I found it at De Anza Junior College in the early 90s. "Edith Wong," it tells us, "is a pootie pootie, hah!" 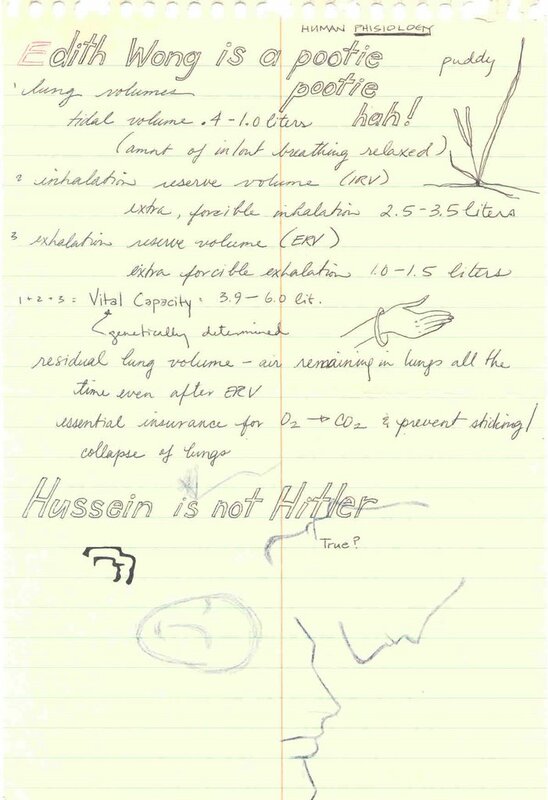 This amid Human Physiology notes about lung volume and lung collapse. We know the author would under no circumstances revive Edith Wong, but we can picture her reviving others. A braceleted hand is extended, either to offer assistance or to dismiss the victim as unworthy. Likewise the profiles and disembodied head: Revived or not? Or do they suggest that the note-taker's mind is not wholly focused on Human Physiology? 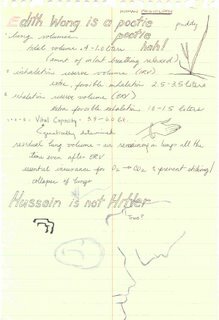 The last comment about Saddam Hussein dates the note paper to around the first Gulf War. It is oddly prescient though. What could the note-taker be reacting to? Is it to put Edith Wong in perspective? Saddam Hussein isn't that bad, but that Edith Wong, on the other hand, is a pootie pootie? That's the great thing about these scraps of paper: they're ultimately indecipherable and wholly intriguing. This last one has a hint of menace. 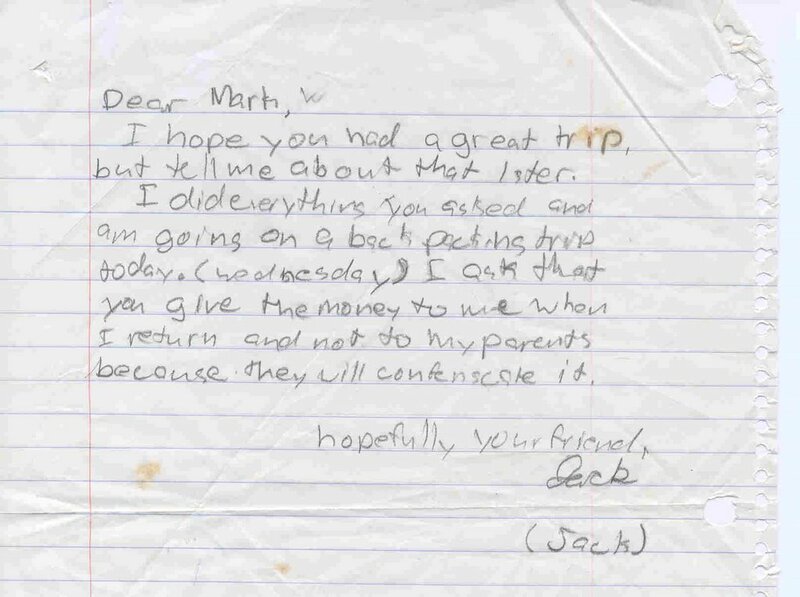 It's Jack's letter to Marti. It sounds like Marti has gone away so Jack can do his dirty work for him -- rub someone out, perhaps. "I did everything you asked," he tells his friend, and now, he implies, I'm getting out of town before the heat gets wind of it. While Jack didn't demand payment up front, now he wants to make sure that Marti slips him a couple thou for his troubles. Naturally he doesn't want his parents to confenscate [sic] it. 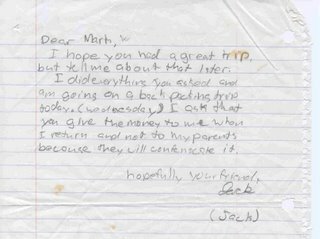 What do they want hopeful young Jack to do, get a paper route? Is it any wonder that when I run into these kids on the sidewalk, I cross to the other side of the street?